Cathay Playhouse presents PALACE OF DESIRE (adapted from a television series) in the Everest Theatre, the Seymour Centre, Sydney. 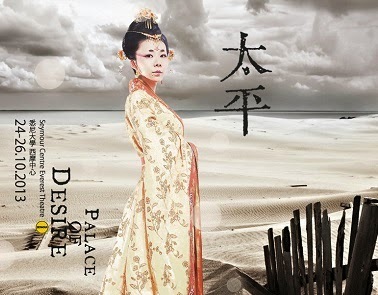 The Cathay Playhouse completes ten continuous years of production with this adaption of PALACE OF DESIRE for the theatre from a Chinese television series (Dramaturgy by Gordon GUO Zi-Qing). The work is a large historic epic played and created, supported by a passionate and disciplined volunteer group of amateur artists. Like the other work that I have seen in past years: DE-LING and EMPRESS DOWAGER (2010) and the famous, THUNDERSTORM (2012) by Cao Yu, the look of the production is quite spectacular, especially the elaborate costuming (not credited in the program), makeup (Livia SHI Lei) and wig design. The Set Design (Sherry GAO Xing) itself is relatively simple and the many locations are easily altered with a large production crew and is magnificently enhanced with a complex and beautiful, black-grey-white background Multimedia design (Kenn HUANG Chun). There is a strong cast of some 28 performers, led by Ariel WANG Yan as Princess Taiping; Denise YE Wei-Dan as Empress Wei; Hannah JIANG Ruo-Han as Princess Anie; Gordon GUO Zi-Qing as LI Longji and especially, Adam SUN Qiao as Emperor Xian. The Director of this epic work is WANG Hui-Li. With the death of Empress WU Zeitan in 705 B.C. the long unified power base of the Tang Dynasty came to an end and the family of Li and the Emperor Li Xian took the throne. The Li family faced quarrelling plottings which were finally settled with the help of the Princess Taiping, daughter of the late Empress Wu Zetian. Nevertheless families became enemies, brothers turned swords against each other, as desire for power unleashed bloody events- for a bloody history between what is known as The Golden Years and the Kaiyuan Heyday Period. The historical figures have been manipulated, perhaps, for dramatic poetic licence to serve a story line, that in action for popular Chinese television and now for the Sydney stage, reminds one of the dynastic struggles created by William Shakespeare in his collection of works concerning The War of the Roses. …The insatiable desire and hunger for power lead to upheavals. Human morality,love and affection, the price for power equates to suffering, sacrifice and butchery. When will power give way? When will the killing stop? When can there be less greed, more peace? If only we were less greedy, if only we desired less, there would be less violence, and more peace. ... (and) However illusive, I find myself unable and unwilling to let go of this dream. A sentiment that all the contemporary world shares today, along with Ms WANG and the Cathay Playhouse Company (and the popular television of China). Performed at the Seymour Centre in the Chinese language with sub-titles, the gentle directorial stylistic gesture accompanied by the immense sweep of the story, the personal and the epic ones, were absorbing in there telling. Cathay Playhouse have moved into this bigger theatre for their performances this year, responding to the growing interest in the cultural/historical significance of their committed work. We look forward to their new work in the coming years, and the contribution that they are making to Sydney and its multicultural profile. Congratulations.